Place 4 quarts water in a medium soup pot and bring to a boil. Trim the root of the onions slightly so that the onions stand up straight. Trim the top of the onion, removing about 1/4". Peel the onions and discard peel. Using a spoon or melon baller, scoop out the center of each onion, and set 1/4 cup aside. Place the onions in the boiling water and simmer for about 10 minutes or just until tender. Remove and place upside down on a cutting board to drain. Preheat the oven to 350°. Heat the oil in a medium skillet and sauté the garlic and reserved onion for 2 to 3 minutes. Add the red pepper, quinoa, salt, and sage. Sauté another 1 to 2 minutes. Mix in the dried cranberries and place an equal amount of the quinoa mixture in the hollowed out portion of each onion. 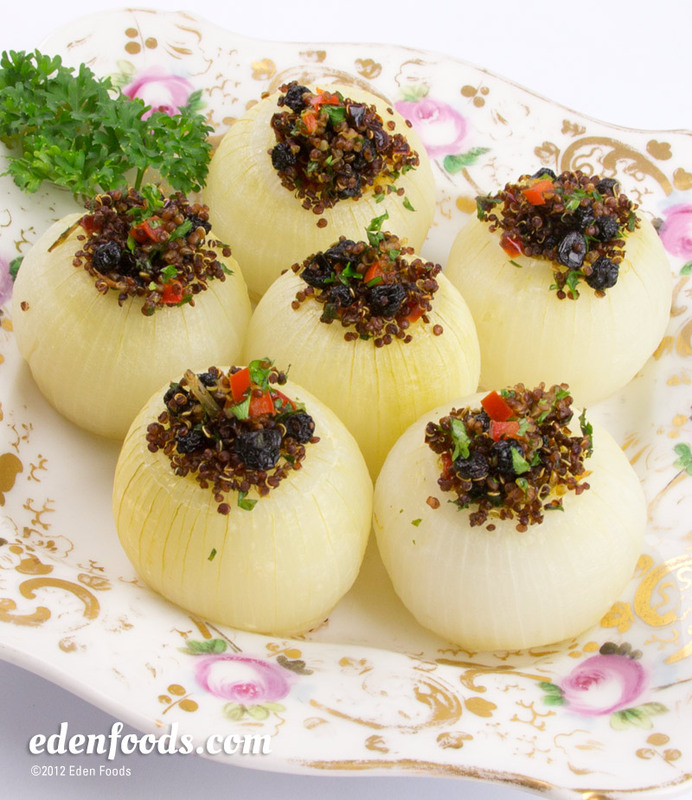 Place onions in a covered baking dish and bake for 30 to 40 minutes or until very tender. Remove and garnish with parsley before serving.